We’re thrilled to share that our True Potential Portfolios have performed exceptionally well over the 2016/17 tax year with investors seeing promising returns in each of the risk profiles we offer. Our flagship discretionary-managed Portfolios offer a unique blend of world-class fund managers and a mix of active and passive investments. A number of investment houses weren’t fully prepared for the referendum result. However, we were armed for either outcome, confident that our global ‘Advanced Diversification’ put investors in the best position. After Brexit, the Portfolios saw a solid performance. This was helped through good currency management within the Portfolios, which meant that the fall in Sterling helped to drive the overall returns upwards, illustrating how diversification around currency added to returns. These methods of investment management were also beneficial during the ‘trump rally’ which once again saw outstanding returns for our investors during a time of unrest. 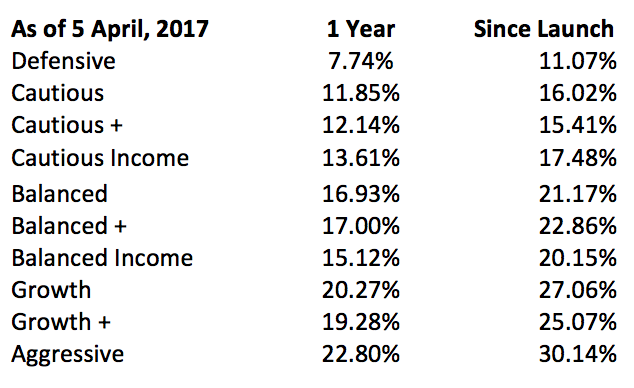 The table below shows how our True Potential Portfolios performed during the 2016/17 tax year, which included two of the biggest shake-ups to the market in history. “We are extremely pleased with our performance figures over the tax year 2016/17. 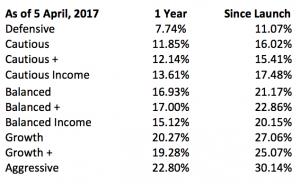 You can see some stellar returns where investors have been rewarded for taking risk. The Portfolios’ framework of managing risk, being low cost and aiming to provide a strong risk: return outcome has worked well. We offer a new level of diversification, not just around geography and asset class, but around investment style, further reducing risk for investors and allowing the Portfolios to weather differing market conditions”. To learn more about our True Potential Portfolios, download a copy of our brochure ‘The Science of Advanced Investing,’ today.